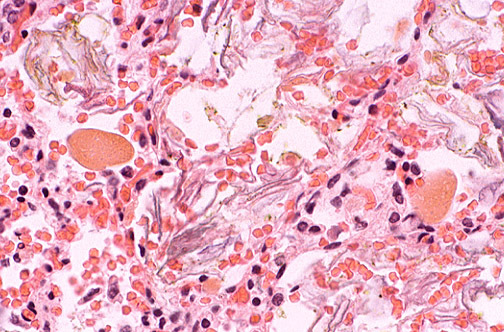 In this case of meconium aspiration, small rounded balls of meconium are seen in an alveolus, along with flattened "squames" or desquamated fetal skin cells that are found in the amnionic fluid. Meconium is an irritant that leads to respiratory distress. At birth, tracheal suction and lung lavage may be useful to help remove the meconium.